Does anyone know of a freeware SPICE / circuit simulator? ngSpice is available for gEDA. gnuCAP is also available for gEDA. LTSpice is free from Linear Technology. Except for simple circuits you will spend most of your time getting models and determining where the models need to be modified for your application. Unless you are doing work for an IC manufacturer the manufacturer will not give you detailed models. You will not be able to avoid a prototype. You should only simulate subsections of your design. Simulating the entire design is not usually practical. Also most of the free simulators are not distributed with models. Re-distribution of the models is usually a copyright violation. LTspice is distributed with models of the Linear Tech parts. I am not sure the quality of the models. Most manufacturers do not want to reveal too many details about their process. A free version of TINA, which includes Spice, is available from TI. This is a very nice SPICE that I investigated some years ago. It can be used with Eagle schematics. Edit components and connections by right-clicking anywhere/on a component. You can build entire circuits using this and simulate it visually to understand how the circuit works. (voltage is shown in green/red, simply amazing) If you start with one of the gate circuit examples, (choose it from the Circuits menu), then you can click on gates or digital signals to switch them on/off, and see your circuit react. my favorite spice engine is the one made by linear technology. I saw ngSpice mentioned above but there is no good port to windows. Its cool if you have the linux box. But I find it has some compatibility issues and library import issues. http://www.linear.com/designtools/ That is where LTspice is, they have filter design tools there too. There are a couple of heavy-duty packages and a lightweight program for Linux. The serious packages are GEDA and KiCAD. They are each a collection of programs that work well together (like Orcad); they include a schematic capture, a simulator, a waveform viewer, and a PCB layout tool. They are very sufficient except my professor requires the ".out" file generated by pspice, so I still have to use that. The lightweight program is Oregano. It's great for quick simulations. The libraries are quick and easy to use and find parts from. The schematic capture is much easier to use and prettier than the other programs. It uses either gnucap or ngspice for the simulations, so they're pretty good. One major drawback that I have found is that the waveform viewer does not provide a logarithmic view and there's no way to get data out of it. 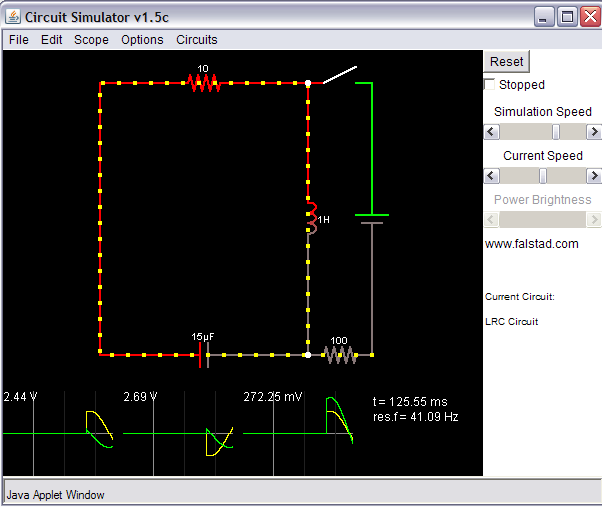 For logics circuits, you can use this great online simulator called Logicly. Not the answer you're looking for? Browse other questions tagged simulation software spice or ask your own question. Can you simulate a schematic? What's the best way to plot the “taper” of a potentiometer circuit? Getting started with electronics - virtual breadboards with IC's? What does a LC circuit in parallel to a speaker do? What are the most widely used circuit simulators in industry? Which of all available circuit simulators provide the most accurate results?